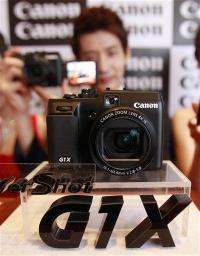 (AP) -- Canon Inc. is moving toward fully automating digital camera production in an effort to cut costs. Jun Misumi, company spokesman, said Monday the move to totally rely on robots and have no human workers will likely be completed in the next few years. He declined to give a date. Japanese manufacturers are moving production abroad recently to offset the earnings damage from the soaring yen. But Canon believes full automation will help keep manufacturing in Japan. It denies the move might cause job cuts.